This is the view on my first morning in Bali, October 5, 2016. I’m sweeping the area where I’ll teach yoga for the guests and workers at the Jiwa Damai Retreat Center I’m calling home for the next two months. Mostly I’m sweeping up any little pieces of gecko poop that landed on the ivory tiles; the geckos like to hang out and scamper along the exposed wood beams in the ceiling during the night and, well, bombs away. Even if they are just a little less than a quarter inch bombs, no one will want to roll their yoga mat over them. It’s 7:00 a.m. In 25 minutes I’ll hit a gong letting everyone in the area know yoga starts in five minutes. You know, I haven’t actually banged that big gong yet so I hope I do it right. It’s wonderfully quiet and peaceful here with just a few workers up and about so my bang is going to change things. Not in the sense of what airline. It was EVA. Boston-New York-Taipei-Denpasar. It was long but a new experience for me and therefore fascinating…even when I was seated in the “Hello Kitty” promotional section (Hello Kitty pillow, napkins, theme menu, etc. – you won’t get that on a U.S. domestic flight!). I mean how did I get here in terms of at this point in life? I’ve been the family guy, raising kids and being a marketing worker for over thirty years. My wife passed way from kidney cancer eight years ago. My three children are now out and on their own. After practicing yoga since in my twenties I became an instructor just over two years ago. Last August I left my full-time marketing position to work a Wanderlust Yoga Festival in Canada and then see where yoga could take me around the world. It took me here. First stop – Bali! Five minutes before 7:30 I inhale deeply and then aiming at the bullseye middle hit that gong three times. Bom! (Perfect, Dave, I tell myself…now wait a second before hitting again). Bom! (same wait, do it right dude). And now, finally, Bom! Later that morning I’m informed by the retreat center director that my effort knocked her out of bed and probably scared the children in the nearby village of Bindu, so will I please back off some next time? However, my first day of yoga teaching in Bali goes well. Sure, this initial class has only other workers at the center participating, but they are from all over the world and in the coming days will become my good friends. I am happy and grateful! I will return to this venue every morning while in Bali. Some days no one will show up and I will do my practice alone. But on other days I have participants from South Africa, the Netherlands, France, Singapore, Australia, Spain and other wonderful places. I put on a class for writers from Yoga Times, and on another day over 20 amazing people here for their own yoga teacher training. Everyday different, but everyday I learn more about yoga, about the world, and me. I will continue to live a yoga inspired life that leads me around the world, and I will write about it regularly in this blog. 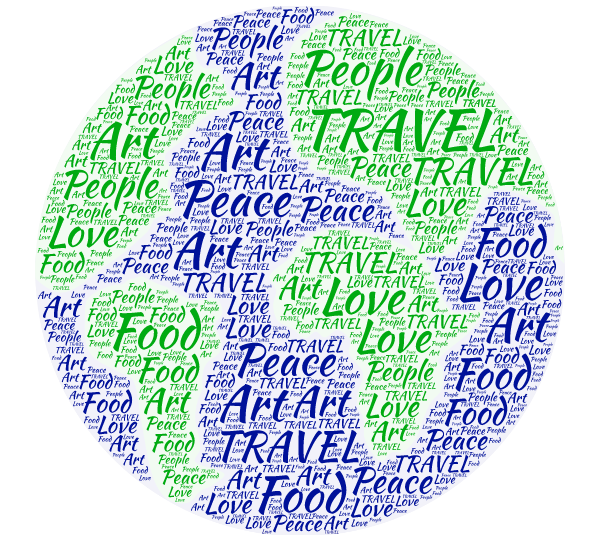 My focus will be on the following: TRAVEL ART FOOD PEOPLE LOVE PEACE ADVENTURE FUN. Thank you for stopping in.